Jerry Dwyer  more formally Gerald P. Dwyer  is an economist who currently is a Professor and BB&T Scholar at Clemson University. From 1997 to 2012, I was a Vice President and Director of the Center for Financial Innovation and Stability at the Federal Reserve Bank of Atlanta. I am fascinated by disruptive developments, such as the cryptocurrency Bitcoin. 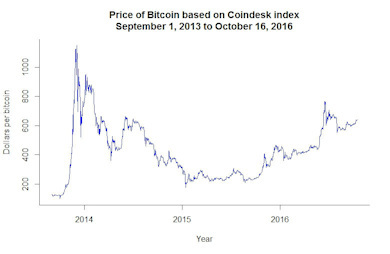 This figure shows what has captured the most attention, the price of bitcoin. It has changed quite a lot from initial trades for 5 cents in 2011. My related research on electronic money and the Digital Revolution is discussed on the page Digital Revolution. Besides being interested in innovation, asset markets and overall economic growth interest me. The role of asset markets in economic growth is one of the questions examined on the webpage on Growth. I also am very interested in monetary developments. Their mismanagement is graphically  and tragically  illustrated by this Zimbabwean 100 trillion dollar bill. Somewhat unfortunately for all, the source of this problem is well known and hard to avoid with government currencies: Printing money is a way to finance government expenditure. The simple but often ignored relationship between money and inflation is laid out on the page on Money and inflation. For a long time, such developments have fed calls for something better. For many, this is a return to a gold standard. Personally, I am more excited by the recent development of private digital currencies such as Bitcoin. I do not think a private currency like Bitcoin will replace the U.S. dollar in the foreseeable future, but private digital currencies do have the potential to limit the damage done by mis-behaving central banks. My recent research interests also include: banking and financial markets more generally than when they perform badly; economic growth and financial development. Research papers and data are available in the links. Some code on random number generators also is available in the programming link. The code is useful to me and may be useful to you. The errors mentioned in the articles and avoided in the code still appear in commonly used programs. The code is in C, but it isn’t hard to translate to other languages. Not surprisingly, these diverse topics are related in my mind. One tie between some of them is my interest in the Digital Revolution and its implications. The pages at the links on the left have copies of recent working papers and descriptions of some recent published articles. The pages also have links to related material. Some material related to courses is included in the courses link. I have been teaching in the John. E. Walker Department of Economics at Clemson University since 2013. I tech time-series econometrics for Ph.D.s. I also teach monetary economics for undergraduates, master's students and Ph.D. students. From 2009 to 2016, I taught the Financial Econometrics course in the Masters in Finance program at Trinity College, Dublin. My vitae and some other less academic material are available at the link about me. Some material on a personal interest of mine  sailing  also is available there. Files are opened into a separate window. You may have to enable popup windows for this site in order to download files. I hope that you find the information here useful. Comments are welcome. Contact Jerry Dwyer at gpdwyer@gmail.com. Website created by Tamara Dwyer and Jerry Dwyer. All material copyright Gerald P. Dwyer, Jr., 1999-2016.